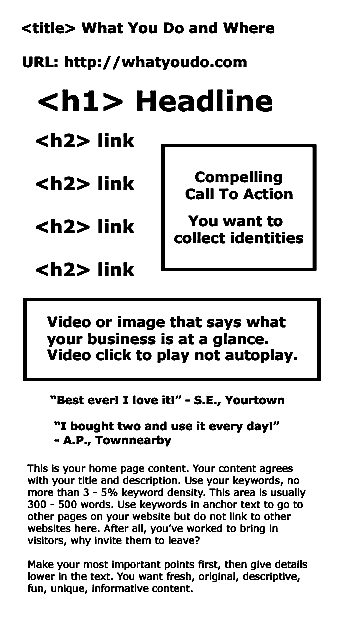 Your Home Page TITLE says what you do and where you do it. A good URL from a SEO perspective says what your product or service is, in the way that your targeted public search for you. Your webpage TITLE, DESCRIPTION and CONTENT must be in harmony. Your Home Page headline should combine keywords and the information that you’ve obtained by surveying your targeted public. For example, if your keyword is Cosmetic Dentist and what the public want most is “painless” then your headline might be “Painless Cosmetic Dentist, Yourtown”. On the right is your compelling call to action. You trade your expertise for the visitor’s email address. People are used to this kind of value transaction. You’re a dentist? Offer a PDF “How To Keep Your Teeth For Life”. You sell groceries? O)ffer a PDF of your 10 most popular recipes. If you prefer, offer a discount coupon. You give value and you get an email address that you you can follow up. On the left you see sub-headline links. These are your main products or services. No more than 10, less is better. Continuing the dentist example, your links go to pages of your website that are all about your particular offerings. If your headline is “Painless Cosmetic Dentist, Yourtown” then these links might be “Dental Implants” and “Teeth Whitening” and similar. You have 3 – 5 seconds to get the attention of a visitor before they click away. In the middle of your home page is an image or a video that shows at a glance what you do, no ther explanation is necessary. The video shouild be less than 90 seconds. A video should not automatically play when your page loads – the majority of persons on the internet find autoplay “annoying”. Next are some brief testimonials. 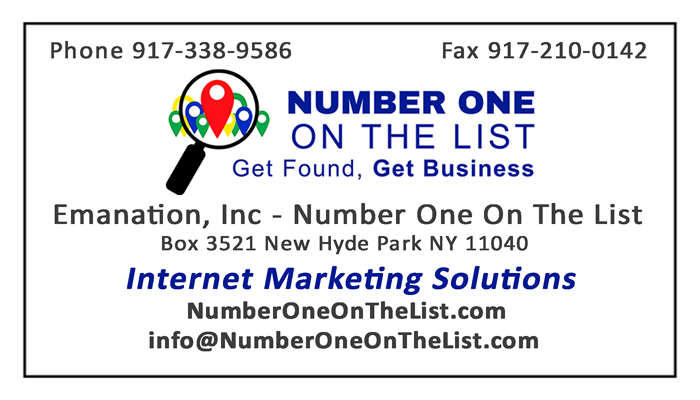 If you have a local business, use testimonials from local clients. Testimonials are powerful Marketing – Bill does it so you should do it too is persuasive. Other people saying nice things about you is more credible than you saying nice things about you. The last thing on my illustration is your 300 – 500 words of text content, an introduction and overview of the material on your website and what your business is all about. Please note that this is not a complete design. The purpose of the illustration is to touch on some important SEO aspects of your home page. Thinking of upgrading, re-doing or promoting your website? Contact us, we can help.